Welcome back, financiers! Before we get into talking about dollars, cents, and mana symbols, I want to thank everyone for sticking with me for the past 60 articles that I’ve written for Brainstorm Brewery and MTGPrice. I’m extremely excited to be on this Avengers-esque superteam that MTGPrice.com has created, and I have dibs on being Iron Man. We’re in the process of ramping up the benefits that ProTraders on the site receive, so please check out this video if you’re interested in turning Magic into a more serious form of income that can work for you. While some of our articles are going behind a paywall, I’m glad to report that my content will remain free to read. Now, let’s get into the real introduction to this week’s topic of discussion. “Man, the reprint of Adarkar Valkyrie really killed the value.” How many times have you heard a statement or question similar to that? When done correctly (or incorrectly, depending on your view of the game and whether or not you own the cards), reprints can absolutely destroy the value of a previously expensive card by overloading the supply in the market. Back in the 1990s, Chronicles nearly destroyed the game due to the massive devaluing of collections across the board. We saw (well, I didn’t personally, as Chronicles was released when I was nine months old) the original five elder dragons tank down to fractions of their roughly $25 values. Learning from its mistakes, Wizards of the Coast was much more cautious with the print run of the first Modern Masters. Popular and hard to find casual reprints such as Divinity of Pride and Adarkar Valkyrie were hammered down to 20 percent of their original prices, and they don’t look like they’ll ever be able to recover anytime soon, especially since they both took an additional punch from the Commander products. Other top contenders for largest percentage price drop due to a reprint have been Polluted Delta, Stifle, and Sanguine Bond. Thankfully, WOTC has managed to tread the careful line between “Every card being on the Reserved List” and “Going full Yu-Gi-Oh! by reprinting practically everything, all the time”. Today, I want to talk to you about making money (or losing less money) in Magic, and how to utilize reprints to your financial benefit. In the past week or so, I’ve tuned into a subset of cards that, when reprinted, have shown enough consistent demand to warrant buying in at their floors post-reprint, because they will continue to show upward trajectory over the next several months or years. I promise that I don’t get extra money in my paycheck for pointing out the benefits of ProTrader, but these daily emails are honestly a huge help in noticing trends that I otherwise wouldn’t. In fact, the detail in these two daily emails sparked my interest for the topic of this week’s article. 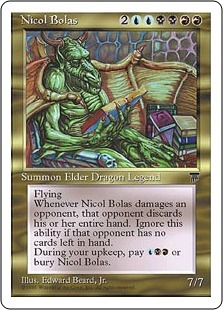 Blame my lack of attention if you’d like, but I was under the impression that the Conflux edition of Nicol Bolas was still only $5 or $6, closer to the price of his Duel Deck version. 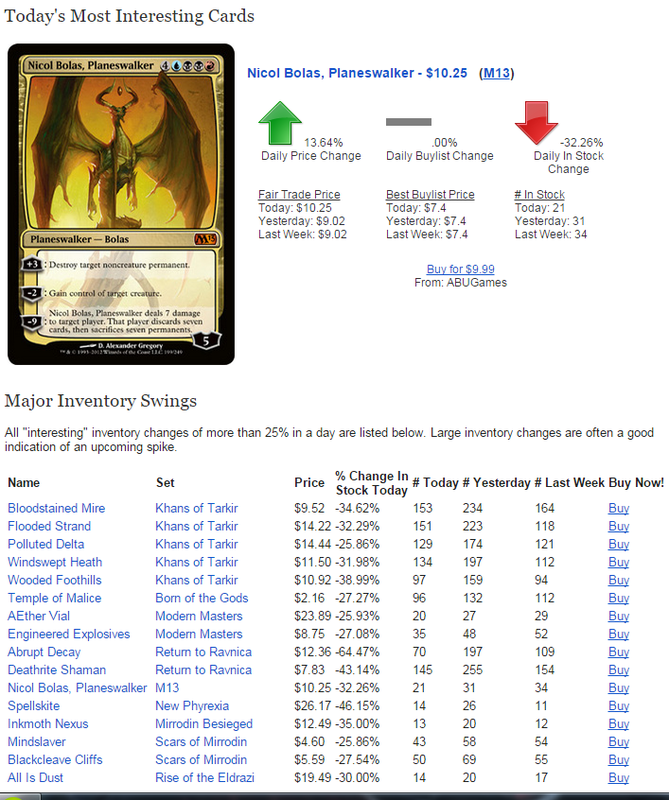 The specific common trait that piqued my interest with both Platinum Angel and Nicol Bolas is that each has been printed at least three times, and yet still managed to climb in price over the next several years after each reprint. While Nicol isn’t cashing out at $20 anymore, he still managed to double up from $5 to $10 since his inclusion in Magic 2013. 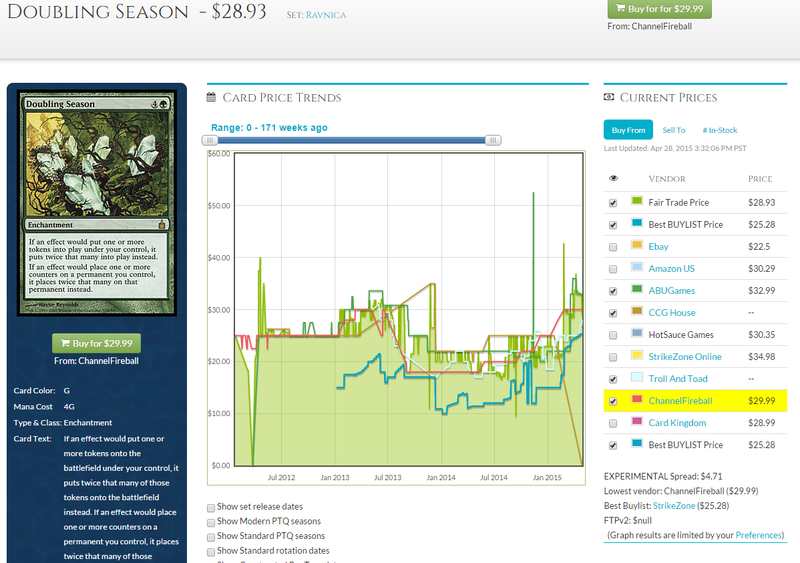 Platinum Angel was scraping $3 back in 2012 after consecutive printings in two core sets, and has steadily reached a plateau of about $8 since early 2014. If you bought in at the floor of either of these cards post-reprint and had been holding onto them in the past few months, you’d be very happy to sell out now. In addition to the “invisible” profit of the cards going up, these are two extremely iconic and popular cards to the casual crowd, so it shouldn’t be too much of a chore to liquidate multiple copies as long as you have a Facebook account or a TCGplayer store. I might be exaggerating a bit here when I use the term “immortal,” but these are examples of the cards that shrug off being “killed” by reprints over an extended period of time. 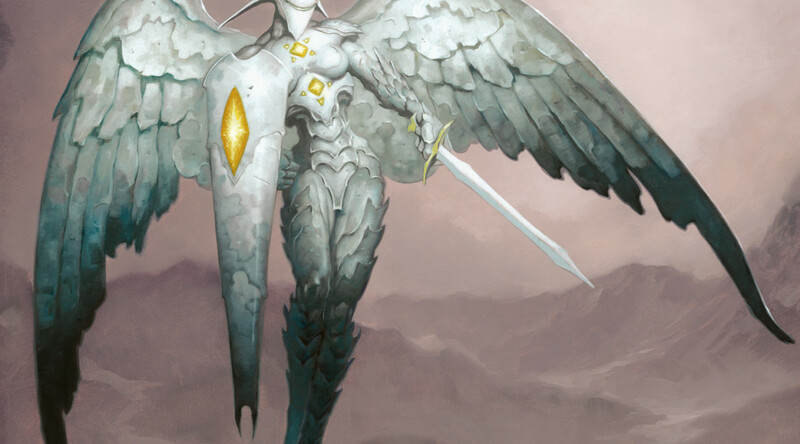 They’re spearheaded by popular or unique casual categories (angels, dragons, planeswalkers, having the ability to prevent you from dying), and grow in popularity with the game. 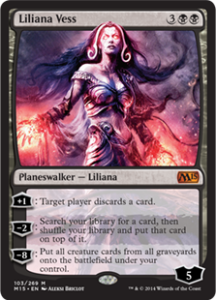 If we continue in the vein of planeswalkers, one of my favorite “immortals” to “speculate” on time and time again has been Liliana Vess. Heh. Get it? She gave her soul for eternal youth, so she’s—eh, forget it. I put speculate in quotations, because I really don’t think there’s a whole lot of risk buying into this version of Liliana every time she drops a bit too far below $10. Liliana Vess has been printed six freaking times, and she still refuses to be a $5 card. While I don’t think we’ll be seeing her again for a while (Magic: Origins will contain the new double-sided Liliana, and then I assume WOTC will be busy trying to prevent her accessorized version from having a $100 price tag. This isn’t to suggest to go out and buy a ton of copies right this moment, but I’ve always been willing to trade for Vess because of how easily she sells, and how casually she shrugs off reprints. Remember when Doubling Season was reprinted in Modern Masters, and went down to $15 from the original Ravnica’s $30? Grabbing a bunch of those at their floor and dumping them today would have provided you with a much nicer investment than most sealed product that you could have purchased around that time, and would have also been easier to move with lower shipping costs. If, for whatever reason, Doubling Season shows up again in Modern Masters 2015(I do not think that this will happen, as I believe Wizards has a plan to implement a different type of Limited environment that Doubling Season would not fit well into) and the price drops to $10, I’ll trade for as many as I can find. Did Someone Mention Modern Masters 2015? Oh, would you look at that. We seamlessly segue’d into Modern Masters 2015. What a well-timed coincidence. If you’ve read this far, then you might be thinking; “But DJ, what about Tarmogoyf, Vendilion Clique, and Dark Confidant? They all shrugged off a reprint in Modern Masters, does this mean that they are the same types of card as those listed above? Am I safe to invest in them with their announced Modern Masters 2015 inclusion?” Well, high-pitched puppet hand voice, I’m going to have to go ahead and veto that idea. MMA2015 is already confirmed to have a larger print run than its predecessor, that much is obvious. The major question is whether the print run will have more of a noticeable impact on the top-dollar cards in the set this time around—and I expect that it will. If you were around for the release of the first Modern Masters, you might remember having trouble finding a box even at $250. SCG was selling boxes regularly at $350, but even they sold out relatively quickly. The big difference this time is that while boxes are approximately $250 retail, at least they are readily found everywhere around the web at that price. What metal-armed, ambitious artificer sounds like a good candidate for the task? 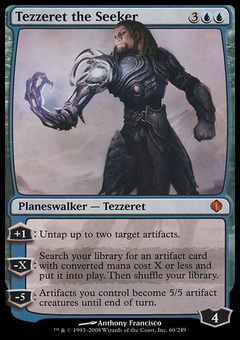 Tezzeret has already been locked in for the set, and he fought back from his Duel Deck reprint steadily over time. As these get cast aside and sold off for more ‘Goyf lottery tickets, I can definitely see him plummeting back down to $6 to $7. When he does, I’ll be more than happy to target all of them in trades, or maybe buy in if I’m looking to place my money in a solid long-term hold. If Tezzeret can survive being ripped apart by angry rat ninjas and being mind wiped by Jace, then certainly our “immortal ” half-metal walker can survive a Modern Masters 2015 reprint. What do you think? Is there anything in Modern Masters 2015—confirmed or expected—that you are targeting at its floor price? Let me know your thoughts in the comments below. And for the record, yes, the features from the captions of the ProTrader emails did grab attention. Yeah, thanks for keeping your articles free. Just FYI, im not buying protrader just because of this BS. It’s not my intention to force feed ProTrader onto my readers. I don’t get paid to mention it, nor am I required to. 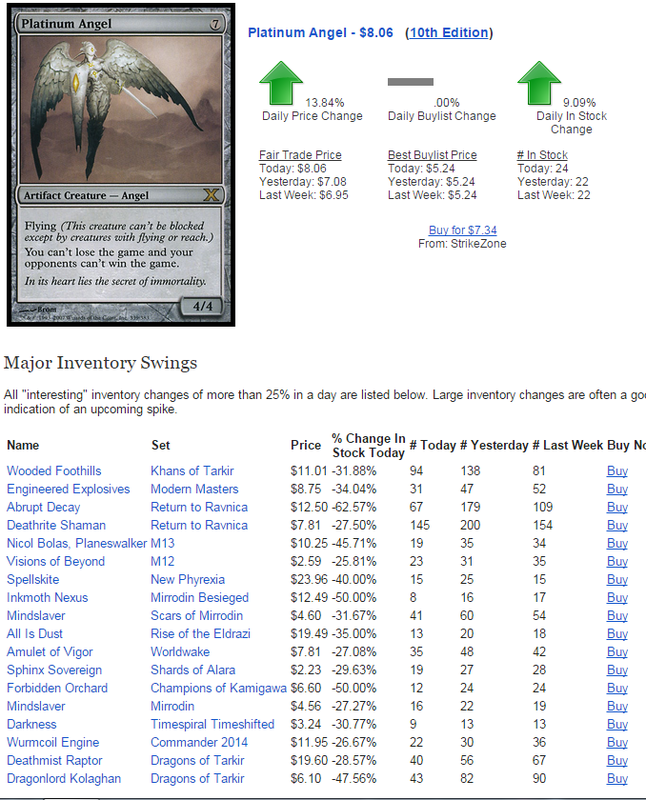 I am fully transparent and willing to mention whatever the best tool is for the job at the time; I’ve talked about MTGstocks in one of my previous articles and how their Interests page is superior to anything we have on MTGprice. If you don’t believe ProTrader is right for you, it very well might not be; it’s not for everyone. Good stuff, I didn’t expect those planeswalkers to hold their value so well. I have to admit, I’ve overlooked them myself, my mind was like: “Reprinted in Duel Deck. Ignore.” Which I guess I can’t do anymore! Also good pick on Tezzeret! Added to my list of MM2015 pick-ups. I’ve been doing some research as a result of Doug’s article all day and one thing I found was that the walkers from MMA aren’t quite as enticing. 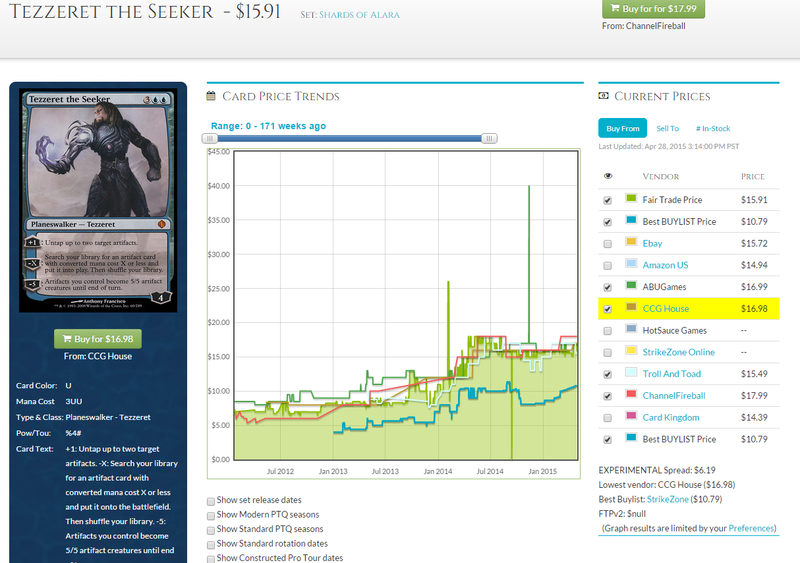 Elspeth KE did have the whole modern event deck bringing her down, but Sarkhan Vol just has some disappointing numbers. Hes by no means a modern staple, but hes a sweet walker so I’m a bit surprised he hasn’t bounced back yet. Great article! I had my fun with Tezzeret before due to the fluctuation of the European market (cards from Spain and Italy tend to be a lot cheaper than in Germany, but most Germans don’t buy from Spain in fear they won’t receive their cards. That said, I think it would be possible to make even more profit trading from Europe to the United States, but this is a huge step for me… anyway, back to the topic). In a short amount of time I was able to buy a dozen at about 4 € (including shipping fees) and unloading them for 7€+. I genuinely hope to grab a crapload this time around, wait I while and unload them locally for an even bigger profit or trading the cards for other targets. Can you elaborate on why buying from Spain in Germany is risky? I have pretty much zero knowledge of the European MTG market and how it differs from North America, so i’m interested. Is it Spain specifically, or just international shipping across borders? I am not really sure myself and can only guess. 1. The German mind-set for most is, that it is only safe to buy from other Germans, because of easier communication and the deep-rooted anticipation that everyone not German is less serious about things. People fear to get screwed over, which is harder to avoid with a language barrier. 2. The shipping costs are a tad higher (1,77 instead of 0,92) and people here don’t tend to buy en mass, but rather few cards (there are those who ONLY bought a common card for 0,05 and paid 0,92 shipping cost… This still confuses me). 3. There is much less engaging in serious MTG finance here. We don’t have buylists (as far as I know) and thus don’t have a reliable outlet for our spec targets once they peak. Most of the time it is a waiting game. And I don’t see a lot of tournament players at my LGS either. Here in Germany MTG is considered to be a hobby for nerds/geeks, because the “regular” players don’t go near a LGS at all. What’s left is a bunch of guys with questionable hygiene who take themselves way too serious (I attended – and won – a draft on FNM and couldn’t even engage in a proper conversation, because they were upset that someone who rarely attends such events is able to win :/ ). So far I’ve got my eyes on Goblin Guide, Noble Heirarch, and Fulminator Mage (pending validation of the “spoilers”). I was expecting these 3 before getting the leaked info either way. I’ll explain more why in the forums later once I’ve finished collecting my thoughts. 1. MMA2015 may have a higher print run but stores have a limited shipping quantity. All my LGS told me: they cannot order as much as people want, they are limited to a number based on previous sales. It seems that all the reprinting bulk is going towards the 3 international events for launch day but if you cannot make the trip, the LGS won’t be able to satisfy you at an MSRP price. 2. Based on that previous info, I recommend everyone to get an extra box for cheap and sit on it. I managed to get all mine near MSRP (damn taxes) and will sit on them as the stores have a limit yet the crowd seems to have grown. Before anyone asks, they are all local stores and they cannot ship internationally. 3. I would be ready to sell or at least trade off major modern staples for other modern stables that did not get a reprint in MMA or will never be reprinted (Cavern of Souls). At least their value will go nowhere if not wherever the trend may be but you won’t lose too much if the reprint does lower pricings. 4. ProTrader Read only sections are a bad way to sell information. If you really want to make people open their wallets, you have to sell it like a book but give it away anyways. This way, if people want to, they can buy it; otherwise they won’t feel obliged or left out. And if you really want to make big bucks, you offer consultation advice over skype at an appointment for an amount/hour. Thanks for the detailed and well-structed comment, Phil. Unfortunately, I’m not the one in charge of whose content is free, and I don’t get to make decisions about that kind of stuff. I just write words about MTG finance, and post them on the internet 🙂 Alasdair would be more than happy to hear your concerns though, you can email him at webmaster@mtgprice.com or tweet @mtgprice. As for Modern Masters; While your store may have a limited quantity, I don’t think people have had trouble finding boxes on the internet for MSRP. ABUgames still has boxes at $249, and eBay hasn’t run out yet as well. I’ve even seen Facebook groups selling them for as low as $240 shipped, which I would have jumped on if I hadn’t already stretched my MTG budget for April. Those who want to find boxes at MSRP definitely have outlets to buy them at that price, even if the local stores can’t satisfy 100% of their demand. Great Article, Thanks! I agree with most folks saying that most/if not all MTGPrice articles should be free. However, after reading the free ones for months I feel that I am now ready to subscribe and become a Pro-Trader. I feel that I have gained enough knowledge from devouring the articles and the rest of the interwebs that I can now utilize the TOOLS that MTGPrice offers Pro-Traders. I’m signing up tomorrow, May 1st, for my first 30 days. wups… $4 per month for 6 months would be $24. $4 per month for a year would be $48. Still a good discount! There is a such a deal: 1 year for $40. I’m sure as hell not the one in charge of making those decisions. It’s definitely something to bring up to the boss though, just email him at webmaster@mtgprice.com or tweet @mtgprice, let him know about it. He’s done deals like that in the past (Before I was a writer here, I was a Lifetime ProTrader for $100 though a Facebook offer to the first 100 people). Welcome aboard, and i’m glad that our content has been able to help! Like the article and thanks for keeping it free. I hope you follow up as more spoilers are released and include cards you feel won’t be hurt by the reprinting. I went back to my original MM box that I cracked and there’s certain cards there that are worth a decent amount of money and have gone up as they saw play like Blood Moon, Summoners Pact, and of course the swords, V Clique, Cryptic, and Pact of Negation etc went up but the “casual” cards have stayed depressed. I think Goblin Guide will be around $5 ish and is probably a good card to pick up cheap. I don’t feel like there’s anything to go out on a limb predicting thus far. I do think Confidant will finally take a significant price hit as it’s really just not played that much anymore…unless Bloodbraid finally gets unbanned. I think the Eldrazi could follow Madlem’s Goyf quote, once you have one Eldrazi people tend to want the other 2 to complete the collection so I’m going to keep my eye out for them. All I know is the time to get OUT of Modern cards was 1-2 months ago. It looks like Scars block cards of any value are going to get the reprint. If there’s no Linvala she’s gotta be in the Angels box set this summer. I am curious to see if most of the cards are Modern played cards or if there’s a lot of “casual” or EDH cards included in this printing. Keep up the great FREE work!! Spencer: That’s an excellent idea that I hadn’t thought of, I’ll put it on my list of article possibilities. I completely agree on Bob, I think the only reason he’s still *technically* $75 is that people don’t want to accept that he’s not played anymore in any format. I’ve been advocating getting rid of him since my first article on MTGprice, and I don’t see any reason to see him as a spec. I’m not sold on the Eldrazi argument though; I think they’ll see a pretty significant drop, and then they’ll be good targets to pick up for the long-term (as opposed to the shorter run logic that Madlem applies to Goyf). Ok, maybe a direct comparison to Goyf was incorrect. I mostly meant that having one Eldrazi tends to lead to collecting the other two imo. I also think that they will drop but will increase again over time and would be a fairly decent investment vs a lot of the other cards that will be reprinted in MM2. Thanks for your response and have a great weekend.